No one rubber or plastic hose can handle every single application, but that’s why SEMCOR is one of the largest providers of industrial hose with a full selection to meet your needs. Rubber lined hose and plastic elements are always designed for specific requirements, from corrosion resistance to the ability to operate while submerged or under high temperatures. Don’t look anywhere else in the Midwest because, at SEMCOR, we have the option that will address your needs at a very competitive price. If your needs are very specific and unique, SEMCOR operates a full fabrication service that can create or customize plastic hose and industrial rubber hose to meet your demands. When you’re ready, we’ll also supplement that hose selection with all of the fittings and expansion joints to make your application a success. Neoprene and other rubber hose is used in conveyances for industries from oil and petrochemical to manufacturing, aeronautics, cement and construction, food and beverage, and much more. It’s safe, strong and benefits almost any application involving movement. Industrial rubber hose made from materials such as EPDM have become the powerhouse of outdoor applications because they’re able to take a lot of punishment in the form of heat, ozone and temperature. While EPDM is the covering on standard garden hose, its strength and capabilities have led to its use in a wide variety of industries. 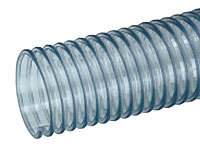 Plastic hose and tubing are often used in fluid applications such as moving water around buildings. They’re also ideal for pneumatic operations when there’s a stable control station but mobile applications. Materials can make all the difference for plastics, with silicone providing significant heat resistance and polyurethane being a go-to for vacuum and various pressure applications. The color and thickness varieties of plastic hose also allow them to operate in complex environments, helping engineers maintain proper function and easing any required maintenance. In addition to excelling in operation while under harsh conditions, this hose goes a step further and make your workers’ tasks simpler as well. Eaton’s Boston Rubber Hose. Specializing in industrial rubber hose, Boston provides a broad range of products to work with any pressure requirement, slow and fast transfer rates, as well as the ability to address complex needs such as hazardous chemical conveyance. Home Rubber Hose. Home Rubber has been creating handmade industrial hose since 1881, and they’re a top provider of quality rubber hose as well as all of the gaskets, tube sleeves and other items you’ll need. Their primary specialty is in food-grade products. Kuriyama Plastic Hose. Versatility is the hallmark of Kuriyama. Their line of plastic hose includes complete thermoplastic options as well as couplings, fittings and other accessories. It’s possible to find an industrial rubber or plastic hose for any application you have. The significant variance and variety of these hoses means they’re often created to customer-specific standards. 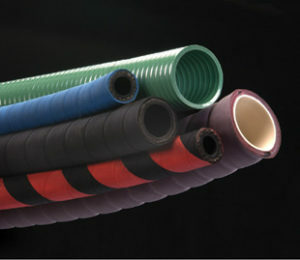 We can help you select the perfect hose in the right color, diameter, material and other requirements. SEMCOR can save you time by providing the best selection of rubber and plastic hose designed for today’s most common and punishing industries. Find what you need and contact us for information on fabrication, supply and pricing.